When I read a press release addressing Sylvester Stallone’s submission of directorial control to Simon West as an attempt to focus on The Expendables’ screenplay (to which he serves as co-writer), I imagined his plastic features behind a typewriter, burning the midnight oil while sipping on his fifth cup of coffee for the night, all the while diligently at work. And then I laughed. 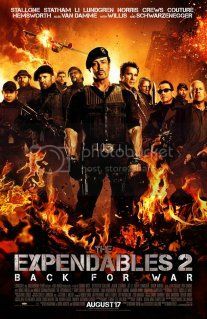 The Expendables 2 is not without its charm. It initially comes across as quite agreeable, if you, like me, grew up on some of the hyper-masculine action pictures of the 80s. A good portion of my cinematic diet as a child was actually comprised of Jean-Claude Van Damme pictures. So, with the Expendables 2, I’m presented with two opposing visceral emotions – one of nostalgic reverence and a second of disinterest for material that possesses insight on par with a sack of doorknobs. I hesitate to even provide a simple synopsis for The Expendables 2, because so much of what this picture attempts to do is illicit reaction out of its perpetual state of nostalgia-gazing. And for that, it actually sort of works. There’s not much to the film beyond a bunch of meatheads asserting their masculinity and bro-ing down. It has a certain level of visceral satisfaction that surprised me. But like its aging protagonists, it can be a lumbering slog once you get past the initial “awe-shucks” factor of seeing childhood badasses duke it out. Having never seen the first Expendables, I have to wonder how most were capable of getting beyond the initial tableau of seeing these characters in yet another tired action sequence after another. There’s a certain limitation to this genre that makes it impossible to ever take seriously. Even the artistic touches in some of Van Damme’s pictures were incapable of escaping the stupidity of their trappings. What we have in The Expendables 2is a conscious effort of providing the simplest form of entertainment through violence and lunacy. It’s self-aware of this effort, to which I suppose some can argue as passable. Being self-aware of one’s own stupidity is not an excuse for making a stupid film. What The Expendables 2 provides is nothing more than a palette cleanser – it wipes the slate clean of other films and bridges one for another potential film of quality. And after watching The Master the night before and anticipating David Cronenberg’s Cosmopolis this weekend, I can’t help but feel that The Expendables 2 fulfills its role.